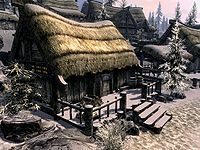 Leigelf's House is the residence of Leigelf in the center of Dawnstar, next to the blacksmith. There are a few steps up to a porch on the front of the house, on the porch are two food barrels and a wooden bench at one end and several piles of firewood at the other. The house faces the bay and is novice locked the majority of the time. This is another single room home, on your left upon entering is a set of shelves holding two leeks, a garlic bulb, three potatoes and has several pieces of cheese on top. Above are two garlic braids, three bunches of elves ear and a bunch of frost mirriam. To the left is a basket on the floor containing two leeks and to the right is a food barrel. In the middle of the east wall and coming out from the wall is a large double bed with an unlocked chest at the foot of it. On the floor to the left of the bed are four bottles of Nord mead. To the right of the bed is a table holding a bottle of Black-Briar mead and six loose coins. 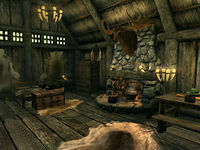 The fireplace is in the middle of the south wall, opposite the door and has a cooking pot in front of it, a steel sword on the mantelpiece and a pickaxe on the hearth. To the left is a hanging rack holding three rabbits and to the left of these is a wardrobe containing clothes. To the right of the fireplace is a long wooden table still against the south wall. On the table is a bottle of wine, three sweet rolls, several loaves of bread, a cabbage and an eidar cheese wedge. In the northwestern corner is a square wooden table and two chairs. On the table are three bottles of Nord mead, a pickaxe, five loose coins and a medium coin purse. This page was last modified on 24 March 2017, at 05:34.